Since its ppm's birthday so here is my Present to ppm! it needs a cameo and ingame screenshot. Can somebody be kind enough to do that? it has two versions, RA2 size with transparent shadows (they can be easily converted to vanilla RA2 shadows in Shp Builder) and TS size with TS like shadows. LKO: 3d model released here. I allow myself to spotlight this in a flash. Another nice enhancement would be a crawl anim, though in this case you give it a limping anim and then use Cyborg=yes in rules.ini. This way the unit even has a damaged-walkanim. You could also give it a simple slow-walk anim while the main anim keeps looking like a running unit. These are pink in RA2 unitem.pal, if I recall correctly. Freezing Cold Shattered My Sorrow. Here's a quick GDI edit I made out of this. I was gonna say that it was already in GDI Colors... until I noticed you edited the pilot. Would it be too much to ask for a 3D model of this? Preferrably with all of the animations. Only asking because that way it would be far more easier to recolor it to match what I would like to use it for . Could do a cameo for public use in exchange. But yeah, no need to emphasis more that this is some epic stuff. Nah, they're not. They work just fine, in the fashion LKO said too. Cameo time. There's also a PSD file in the zip, where the soldier is one layer and sky, shadow & BG are one. Might help if someone wants a different background, or to recolor/edit the soldier. For the Vehicle Version it might be a nifty little touch up to instead maybe make it explode. And use FlameGuy as one of his animations. Just gonna be nitpicky... but why was your Tesla Trooper suffering from Anti-Alias Syndrome while this one didn't? What about if we put a Grey Knight in his Terminator armour (enclosed APU), and put him in his Terminator armour in a mech (Dreadknight)? Well, There's a difference between Tactical Dreadnought armour (Terminator armour) and a normal Dreadnought. And the Dreadknight mech itself is also different from the Dreadnought. 40k likes to overcomplicate things, like a good 2000AD derived story should. The conversion would be simple to do tho. Maybe later I will do those. I have experience and even palettes aimed for these stuff. Funny how within a day, there were 3-4 SHP edits of this one, all of them good. Here's the GDI edit I made out of this. Tried to do some sort of cameo that sits in with the default Westwood ones. I have gmax and some free 3d modellers..
My dream actually was to convert my most favored Kane Wrath's Redeemer into TS shp format, complete with all necessary sequence.. oh boy.. it's haunting me for months of how to do that. Or.. may be someone already do that...? 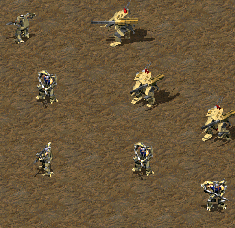 I really like mech/walker/robotic units but not 'the too humanoid' models..
but animations can be done with bones and/or IK. 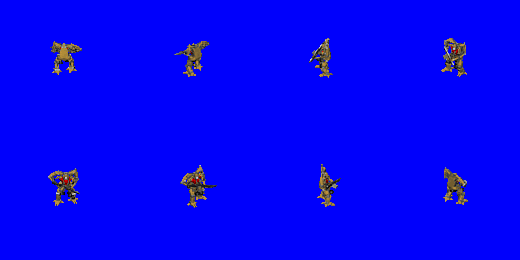 the soldier inside the APU is a single mesh and uses bones and IK for animations, whereas, the APU is made of lots of separate meshes using IK (no bones needed). as for the 3d model. i'll upload it here at ppm if i manage to bring its size down to 8 MB. currently its 18 MB zipped. any help regarding this will be greatly appreciated. Well I suppose in theory you could use 7-Zip to compress the scene files into an archive using more powerful compression algorithm than basic deflate compression, namely LZMA. It should allow you to use it with zip archives too if I recall correctly. The problem with this approach is, that some programs might have problems decompressing LZMA zips. That, and I am not sure how effective it is on 3dsmax scene files. It probably wouldn't reduce size of texture (JPG/PNG) files at all, though. Uploading the file somewhere else instead of putting it here as an attachment is probably more viable option, however. I wonder why it's that huge in the first place. 18MB zipped is gigantic. Outgoing from the picture, the model is quite low detailed and consists mainly out of primitives. Only the soldier is a bit more detailed due to many round surfaces, but i doubt it has more than 100.000 polygons. IK and HI solver, bones and other helpers don't take much space too and can be even quite well compressed when using zip on the max file. So the only thing that can raise that much the size are ridiculously huge textures. Something along 2000x1000 uncompressed bitmaps. Though normally 3dsmax only links to them and not includes them in the max file. If it's 18MB zipped, the max must be around 25-40MB big. A model of that size has to have more than 30-60 million polygons. However the APU in the first picture can be done with less than 200.000 Polygons. Unless you did 1000 copies of the model, one for each little frame, i have no clue how you achieved such a big max-file. 7Zip already uses LZMA2 in 7zs. Usual LZMA zips fail to open within WinRAR (Total Commander and WinZip can handle them well, even XP too IIRC) shown by Nikademis a year ago or more when I used that. also, since I know how ImP models.... I simply just assume these are just that big polygons. How about splitting that 18 MB file into, say, 6 files (each about 3 MB)..Before uploading them, make sure you check all of them by recombine them back and see if everything still intact.. Sorry if this request sounds too much..
Winrar can split files to however big you want, no recombining necessary. for both ra2 and ts ? the zone trooper could be simply converted to an shp because it already is quite detailed thanks to the texture. Most of those infantry units were created for Mental Omega, so no. 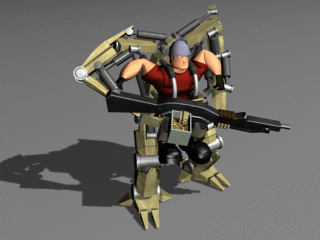 Wait is this is used as the railgun commando in TI? I thought so thank you.